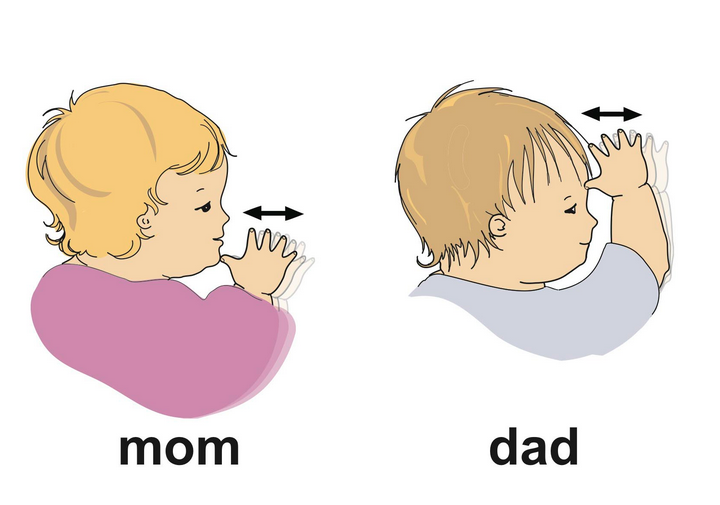 Did you know that babies can do sign language? They can communicate with sign language well before they can with words. We started signing with Benjamin when he was just a few months old – right when we felt he could focus on our hands and mouth. We’d say the words out loud and give him the hand motions and then feel like fools for doing so. And then one day, when he was about six months old, he gave us the “milk” sign while nursing. That’s when we knew this was going to be a great thing. A 6-month-old with a specific communication for his hunger!? Amazing. It truly is an amazing experience having a child that purposefully asks for what he desires instead of screaming out of frustration. You don’t need to worry about using signs inhibiting language development. My child has 4 distinct verbal words at 13 months old in addition to his signs. Signing simply enhances the language we use. It really is a fun and rewarding way to interact with your baby. For more information, read these articles from BabyCenter and psych central. This entry was posted in Babies, Brady Evans Venables, Children and tagged Babies, baby sign language, Brady Evans Venables, Columbia, every woman blog, lexington medical center., Midlands, South Carolina by lexingtonmedicalcenter. Bookmark the permalink. wow! Such an interesting read. Thanks for sharing!